By buying this product you'll earn up to 379 Rewards points. What's better than a Sonos One (Gen 2) wireless speaker with Amazon Alexa built-in? How about two? Keep one in the family room and the other in the kitchen, or wherever you spend most of your time. With two of these speakers, you're not stuck in one room to use Alexa voice commands. 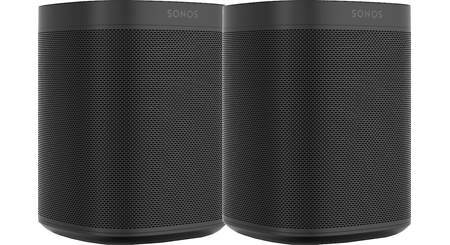 Grab two Sonos One (Gen 2) speakers in the same color, or mix and match. Alexa turns these Sonos One (Gen 2) speakers into voice control hubs for your Sonos multi-room system. Tell Alexa to turn up the volume of the Play:5 in your living room, or play your party mix through every Sonos speaker in your home. These Sonos speakers let you access many of the services Alexa has to offer. Start by downloading the free Amazon Alexa app to your smartphone to set up your “skills.” These are the services you can direct Alexa to access. They include information sites, popular smart home brands such as Nest and Wemo®, sports sites, and more. This 2-pack can be the start of a larger multi-room audio system. Place Sonos speakers like the Sonos One, Play:1, or the larger Play:5 in every room where you want to listen to music. 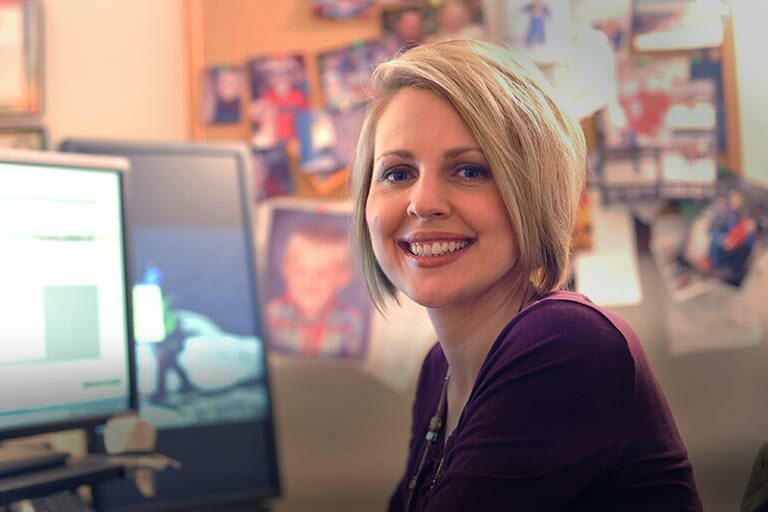 You can set up the players to work on your existing Wi-Fi® network. Or, you can connect any Sonos speaker to your network router, and Sonos will create its own dedicated wireless network for even better performance. You can also use a Boost to create this network if you can't place a speaker near your router. If you use the Sonos app on an iPhone®, iPad®, or iPod touch®, you can use it to fine-tune these speakers with Sonos's Trueplay feature. It uses the mic built into your mobile device to measure how the sound reflects off your walls and furnishings, and then it adjusts the speaker's settings for the best possible sound. 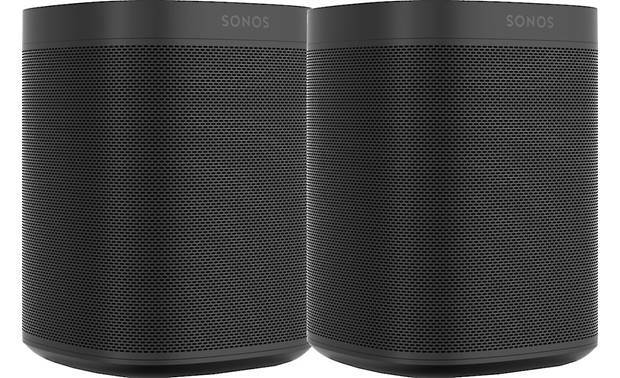 Sonos One (Gen 2) speakers cannot be paired with Play:1 speakers for stereo. 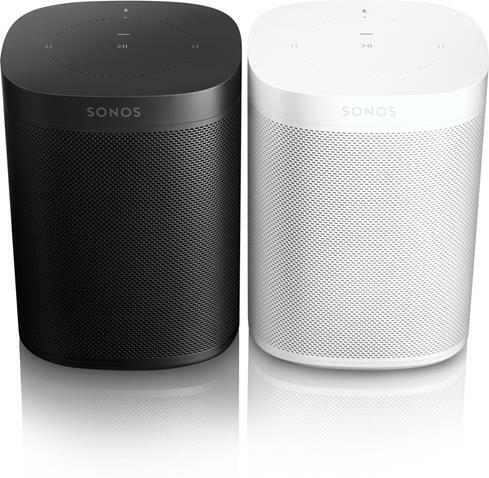 Sonos One 3-Room Bundle: The Sonos One 2-room bundle consists of two individually-packaged Sonos One (Gen 2) speakers. They can be used in individual rooms as part of the Sonos wireless multi-room music system, group two as a stereo pair, or use them as part of a home theater speaker package. Dimensions: Width 4.75", Height 6.375", Depth 4.75", Weight 4.08 pounds. 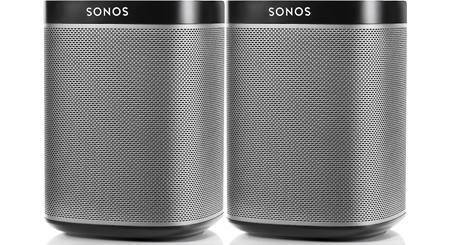 Searches related to the Sonos One (Gen 2) 2-pack Two wireless streaming music speakers with built-in Amazon Alexa and Apple® AirPlay® 2.